A major fire has destroyed a busy nightclub in Birmingham's city centre. Five hundred people had to be led to safety as the blaze took hold in the early hours at Edward's No.8 club. Ten people were treated for minor injuries but firefighters, who praised nightclub staff for their actions, say all inside the club escaped. 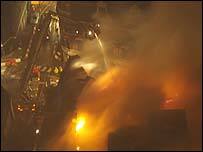 Up to 50 firefighters tackled the blaze and prevented flames spreading to nearby apartment blocks. Structural tests will be carried out later. About 25 firefighters remained at the scene in Lower Severn Street on Sunday. Sub divisional officer Gary Yendell, of West Midlands Fire Service, said: "Considering that 500 people [were inside] I think it's a very good success story in terms of the evacuation. "And that is down to the training of the door staff and the management." Fire crews were first alerted to a fire in a men's toilet at the club at about 0110 GMT, and appliances from across the city were called in. It was initially feared that clubbers could have been trapped in the burning building but it was later determined that everyone inside had escaped. One eyewitness, who lives in an apartment block close to the scene, said he could see flames and smoke shooting from the roof of the club. Rabinder Bhachu, a BBC employee, said: "I was woken by the noise of the fire engines, as well as the smell of smoke coming into my building. "The club is between two streets, and there seems to be flames coming from either side of the building. It does seem to be spreading."